I've been on and off the wagon with diet soft drinks for years now. I've read the scary articles, I know the claims of how bad they are for me. But there is just something about a soft drink I love. And since I'm diabetic, I have always opted for the non-sugar version. But oh, Aspartame, you are Satan. The other day, I was at Torchy's Tacos, and they had a cool variety of soft drinks. Mostly the brand, Maine Root. They had this one called Mexicane Cola- and they had the diet version of it as well. I don't really know for sure, but something made me think that perhaps this soft drink did not use the dreaded aspartame. But it got me poking around on the internet, googling "diet soft drink without aspartame", or maybe I even wrote, "diet soft drink Stevia"... 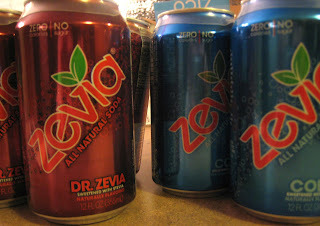 I am still not clear about the Mexicane Cola, but I did read about another brand called Zevia. It's pinned, "All Natural Soda", and with a name like that, they want you to know it's made with Stevia, which is a plant based sweetener. Not so scary like Aspartame. But in my past experience with Stevia, it's also not as sweet and sugar-like as Aspartame based sweeteners like Equal. Anyway, I bought two 6-packs at Target tonight. One is "Cola" and one is "Dr. Zevia"- Their equivalent to Diet Coke and Diet Dr. Pepper. Tomorrow is the big day. The taste test. I am so prepared to like this. And to get Diet Coke and Diet Dr. Pepper out of my life once and for all. I JUST switched to Zevia because I'm a Diet Pepsi addict. It's not as good as actual diet pop but it's a pretty good alternative. Lucky for you you can get them at Target, we don't have Target and I can only get them at a specialty health foods store and they cost about $1.67 a can, yikes! But it's worth it because there is NO aspartame in it! Good luck! Let me know how you like it! So? How was it? Was it good? I don't think I've seen this anywhere, but I'm going to pay more attention the next time I'm shopping.